Recently opened on Broaday at The Music Box is play The Farnsworth Invention, the dramatic story of the invention of television as told by the master of the genre, Aaron Sorkin. With crisp dialogue fans will remember from The West Wing, Sorkin plays fast and loose with the story of Philo T. Farnsworth, a Mormon originally from Utah, who at fourteen drew a picture for his ninth grade science teacher detailing how moving picture and sound could be conveyed across a distance with the use of a combination of the vaccuum tube, photoelectric materials, and electrons. The young genius spent a year at Brigham Young University, did a stint in the navy, and then found the funding that would allow him to bring his theory to life. Farnsworth near success (he never solved the issue of lighting) would bring him into direct conflict with David Sarnoff, the first king of the media, President of RCA and founder of NBC. Fanrsworth's patent for television was in direct conflict with RCA's patent. Sorkin plays fast and loose with the truth, in fact reversing the history, almost. 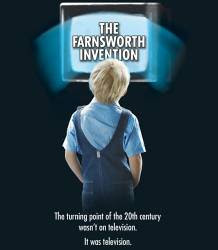 The truth of the matter is The Farnsworth Invention manages to tell the story of the most important invention of the 20th century in a way that is filled in equal parts with comedy and drama. 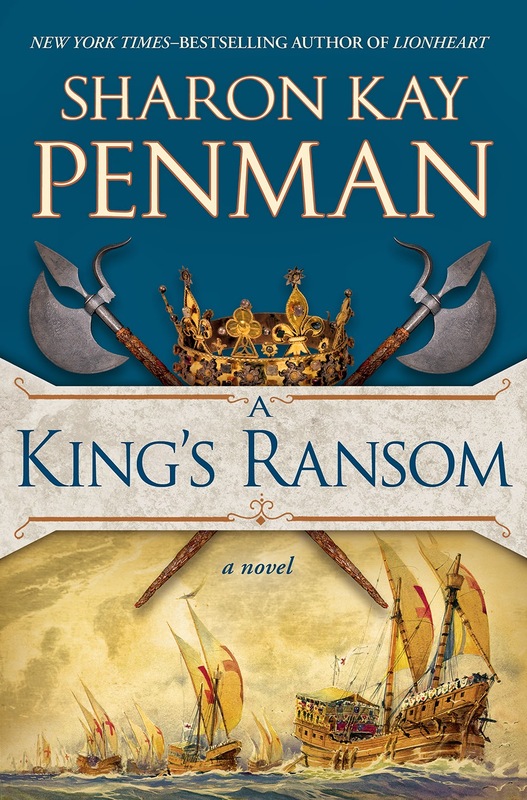 The dialogue is crisp, the direction is original, and the acting is superb. 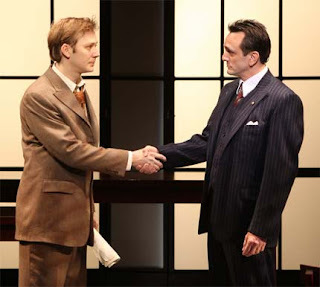 Hank Azaria (of Simpsons fame) plays Sarnoff, bringing gravitas to the stage, both the gravitas of the actor himself and that of his character. Sarnoff did more to create the 20th century then any other individual who walked the earth. Azaria is funny, as one would expect, but he has moments of touching poignancy, that make Sarnoff more than just a two-dimensional foil for the underdog Farnsworth. Jimmi Simpson plays the young Mormon genius. He is bright and energetic but manages to communicate a hint of the depression Farnsworth battled with constantly after the death of his son. Azaria and Simpson share the narrating duties, each telling elements of the other's story, which helps the stories to overlap, increasing the pace and movement of the drama. All in all, this is a play well worth seeing, for the history, for the drama, for the laughs, and for the fun. See it for Aaron Sorkin's dialogue. See it for Hank Azaria's comedic timing. In other words, just see it. Sounds so interesting. I agree that Azaria is such a great actor. And to think that he's on the Simpsons, too!